I really hate to be the bearer of bad news, folks. Honestly. I know how incredibly, deliciously, insanely enticing Nutella can be. I know that Nutella has quickly become a staple in the American household in the last 2 years. I wish I could tell you YES! Buy a year’s supply! Use it in those homemade cookies of yours! Eat it everyday. — but I can’t. If I remember right, I think I bought this only one time, before I made the switch to real food and subsequently lost 25 lbs. Once I started really looking at labels, I knew that I couldn’t put this in my cart. Hey, I’m all for chocolate, especially chocolate & nuts — mmmm. But sometimes we gotta take a stand, and I’m here to tell you why. Nutella can seem like a healthy food on the outside. I mean, the ingredients seem simple enough — milk, nuts, sugar. Harmless, right? Even the commercials advertise Nutella as part of a “healthy, nutritious breakfast”. Not so commercial Mom, not so. 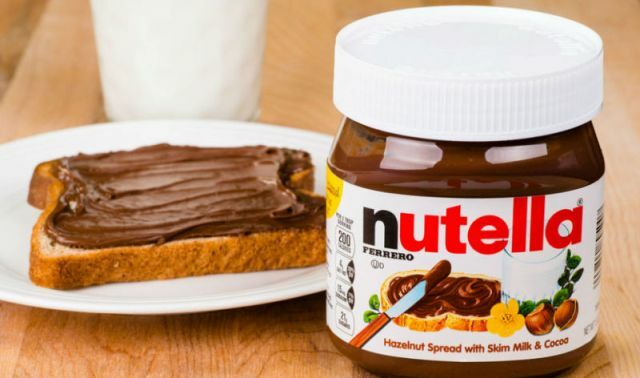 The health claims by Nutella’s commercial came underfire in the California courts in April 2012. A mom argued that she was convinced from the commercial that Nutella was healthy for her child, and therefore fed Nutella to her child. Aside from the fact that this mom should have probably known better, she is right about one thing — Nutella definitely is NOT part of a healthy breakfast. Or a healthy anything. SUGAR – There are 21 grams of sugar in 2 TBS of Nutella. That’s as much as a Kit Kat! That’s as much as 12 pieces of Tootsie Rolls! And on top of that, it’s not even real sugar. It’s genetically-modified beet sugar also known as “really cheap so us corporations can make a big profit, also full of pesticides and DNA-altered so your body doesn’t recognize it” SUGAR. This kind of sugar is a NEUROTOXIN. Neurotoxins are toxins that have the ability to cross the blood-brain barrier. They cause cell death in the brain and exacerbate a myraid of issues namely ADD, ADHD, Autism, Aspergers, depression, anxiety, migraines, etc. Looking for REAL SUGAR? See where I buy mine here. SOY LETHICIN – Oh soy, how doth I explain thee? Okay, ya’ll I will just come out and say it. SOY AIN’T GOOD FOR YOU! Soy is known to cause thyroid depression, weight gain, malaise, constipation, delayed menstruation, and ultimately, breast cancer. Soy stimulates existing cancer growth, accelerates the onset of puberty, lowers your testosterone, and decreases fertility. Yeah, not gonna be your friend, that soy. Some people argue that soy is consumed by Asian cultures often so it must be good for us. The truth is that Asian cultures actually only eat small amounts of fermented, organic soy as a condiment and not NEARLY in the AMOUNT it is packaged and fed to Americans today. Also, the soy grown here is almost always GMO soy. PALM OIL – Palm oil in fact is a very healthy saturated fat, and a great addition to one’s diet. BUT, with the demand of palm oil has come the downside of how it is being obtained. Deforestation and orangutan extinction is why you must make sure that the palm oil you purchase comes from sustainable sources. Check out where I get my palm oil. VANILLIN – “No artificial colors or preservatives” the commercial states. “Oh, but we conveniently forgot to mention there is an artificial flavor. No biggie.” Actually, it’s a BIG biggie Mr. Nutella man. Vanillin is an artificial flavoring meant to “trick” your brain into thinking you’re tasting real vanilla. But you’re not. Your brain is confused, vanillin wins the battle, and kicks you while you’re down by crossing the blood-brain barrier as a neurotoxin and taking out a couple of brain cells while he’s there. Also, Vanillin is EXTREMELY addicting. It bonds with receptors in your brain, causing a release of serotonin, or the “feel good” hormones. This is why you see pictures like this all over the internet. SKIM MILK – Oh man, don’t even get me started on skim milk. When I say skim milk you probably picture a beautiful milk maid setting fresh milk on the counter in a stainless steel pail and every so gently, removing the cream. Uh, yeah, not even close. In the skim milk in Nutella you’ve got some pus-filled milk from sick cows being fed hormones and GMOs and antibiotics and candy and who knows what, then the milk is highly pasteurized, then forced through a homogenizer, then fortified with some synthetic stuff so you feel good about getting some vitamins that your body can’t utilize anyway, then since the milk looks and tastes like water, they’ll add some powdered milk, which is chock full of oxidized cholesterol, one of the most dangerous forms of cholesterol out there. Whew. This milk maid needs a nap. If you wanna read more about what I really think about milk, check out my post Is Low-fat dairy making you FAT? Hey commercial mom, you still feelin’ good about how Nutella makes your kids ready to “tackle the day.”? More likeready to tackle more Nutella when they get home. Don’t worry, I’m not gonna leave you without a good Nutella alternative. I have an awesome recipe for ya’ right here…Quick Homemade Nutella. So, make the choice to say NO to Nutella for your family! And trust me, your family will be better off without it!